Welcome to our Wednesday Night Sand Volleyball League! Thanks for joining Mile High Sport & Social Club for our first session at Monaco Park! For full teams that registered, please make sure you e-mailed Mike your team's roster (Name, address, e-mail & phone #) for each player on your squad. 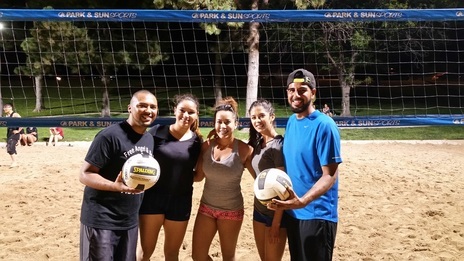 Welcome to our Monaco Park Fall Sand Volleyball League. Please arrive a few minutes early to sign-in on your team's waiver and for the rules briefing. If you have any questions, please contact Mike at 303-923-5645! League e-mails have been sent out, if you haven't received it yet, let us know! Sign-up for next season right now! Located just 5 minutes away from Monaco Park, this is a great spot to hang out before and after the games. Please park on Monaco Street - there's tons of parking for a league on both sides of Monaco. We'll be set up at the sand pits! Your end of season tournament will be tentatively held on August 3rd - Wednesday Night, pending no weather cancellations this session. This section will be updated if our season becomes extended due to weather cancellations! If we have a weather cancellation, please reserve August 8thh as the back-up date!